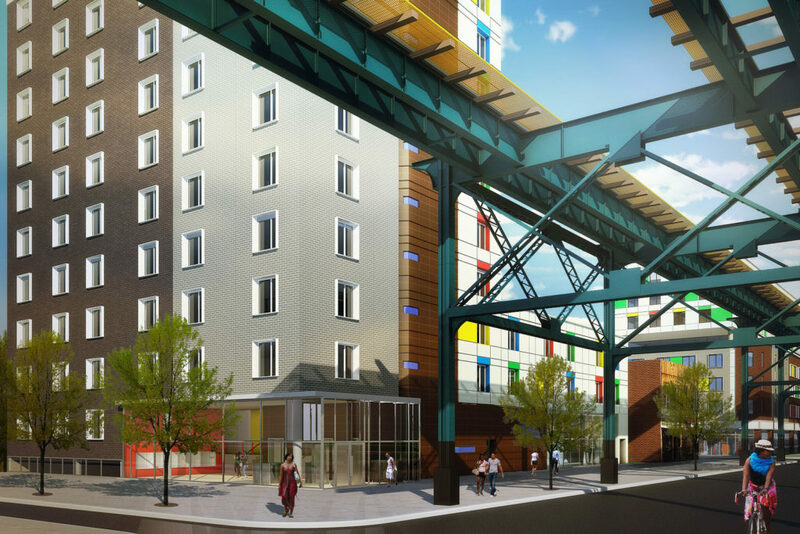 Freeform+Deform teamed up with Alex Gorlin Architects to design a an affordable residential housing mix-used development located in the Livonia Avenue commercial corridor under the elevated train in East New York Brooklyn. Site 6 will house 68 apartments with a mix of 22 Studios, 18 1-BDRM, 19 2-BDRM, and 9 3-BDRM. 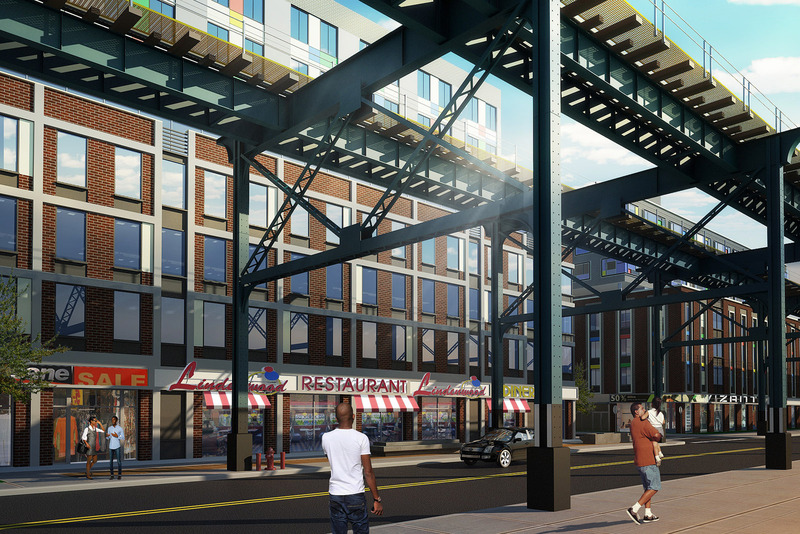 The ground floor retail space of 6,000 square feet, including Lindenwood Diner Site 7 will house 93 apartments divided into: 31 Studios, 26 1-BDRM, 27 2-BDRM, and 9 3-BDRM. The ground floor contains a community facility space of 8,050 square feet. 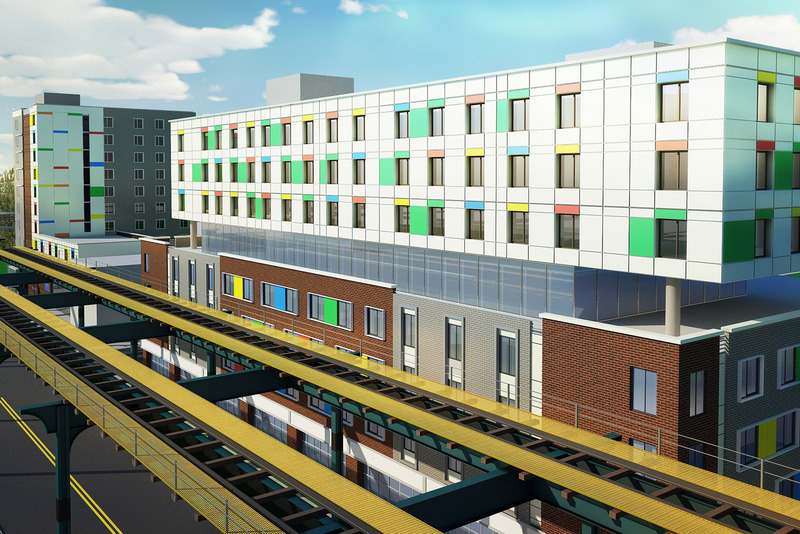 Site 8 will house 85 apartments with a mix of 14 Studios, 31 1-BDRM, 31 2-BDRM, and 9 3-BDRM. The ground floor retail space of 8450 square feet could be easily subdivided to suit future tenants. Site 9 has 111 studio units, with 4,500 square feet community facility. The building also offers 3,000 square feet of recreation space, a fitness area, laundry facilities, a green roof with roof gardens, and 60 bicycle parking spaces for residents. The four sites are conceived together architecturally and programmatically. Each of the first three buildings (Sites 6, 7, 8) are mixed-use retail and residential. The ground floor retail corridor creates a pedestrian friendly streetscape. Our concept for the building facades focuses on the pedestrian experience. Along Livonia Avenue, the façades are treated with a mix of different brick and metal panels to provide visual diversity to the 200-foot long fronts. The shops are a generous 15 feet high and provide bright storefronts to enliven the street. A continuous illuminated signage band unifies the frontage and provides additional lighting at night for safely and for the encouragement of evening strolling and shopping along Livonia.